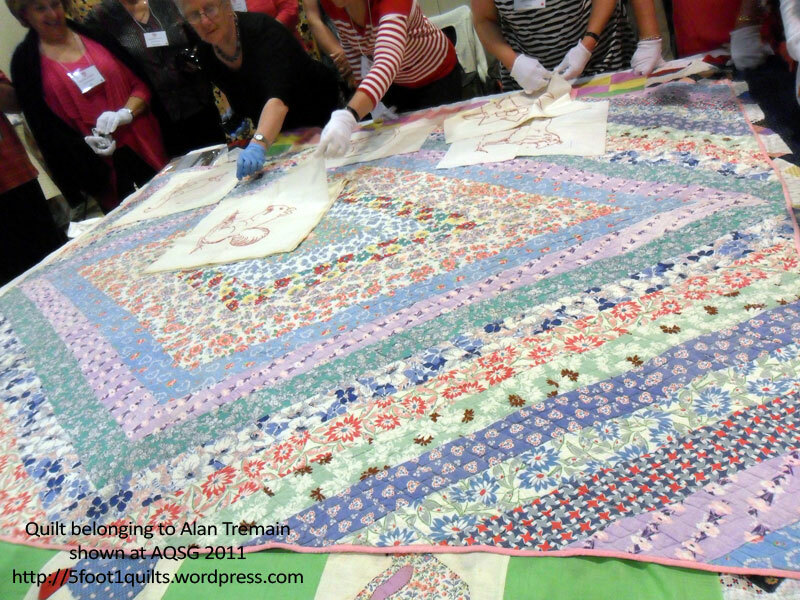 the 2011 Australian Quilt Study Symposium hosted by Quilt Study Group Victoria and all I can say is Wow! I travelled down from Castlemaine by train to ‘The Immigration Museum‘ where the two day symposium was held over the weekend. I quickly lined up to sign in with many ladies and a gentleman or two, who had travelled from Queensland, NSW, WA and TAS as well as local attendees. 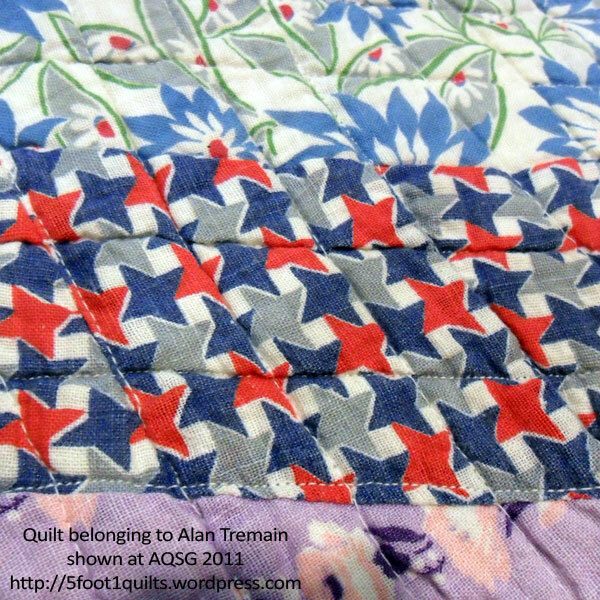 The day started with an introduction and welcome by Janet O’Dell, Convenor, Quilt Study Group Victoria. 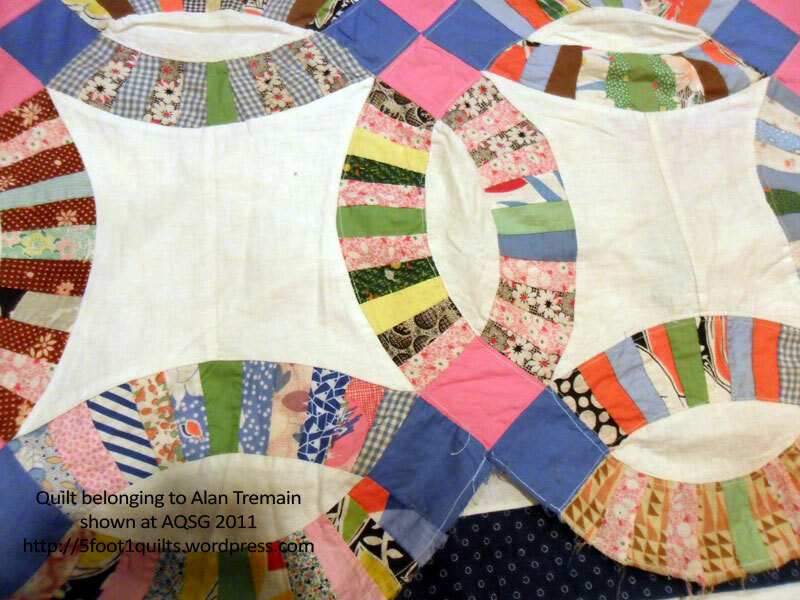 Janet spoke about a fabulous hexagon quilt from her collection which she refers to as the ‘The Braddyll Quilt’, but was originally called a ‘GRANDMOTHER’S FLOWER GARDEN’ QUILT‘ by Christies when it was listed for auction. 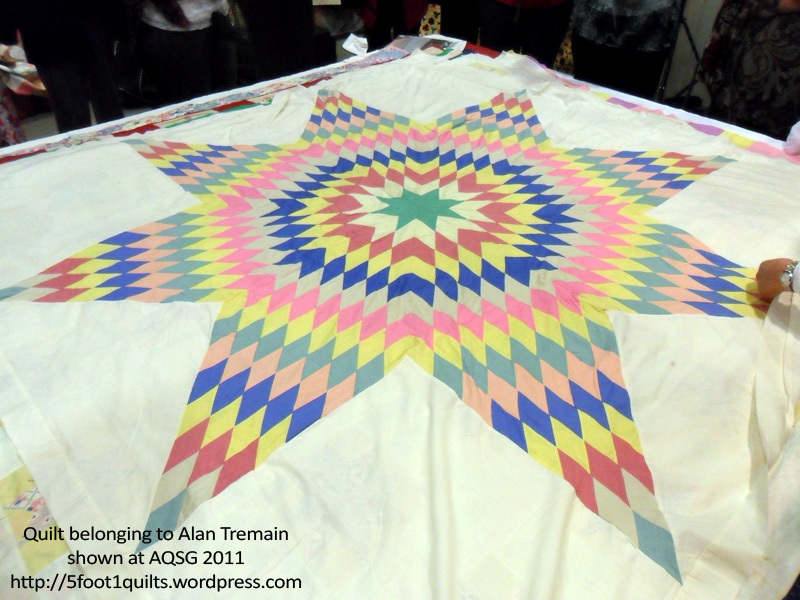 I was able to spend quite some time having a close look at this amazing quilt. 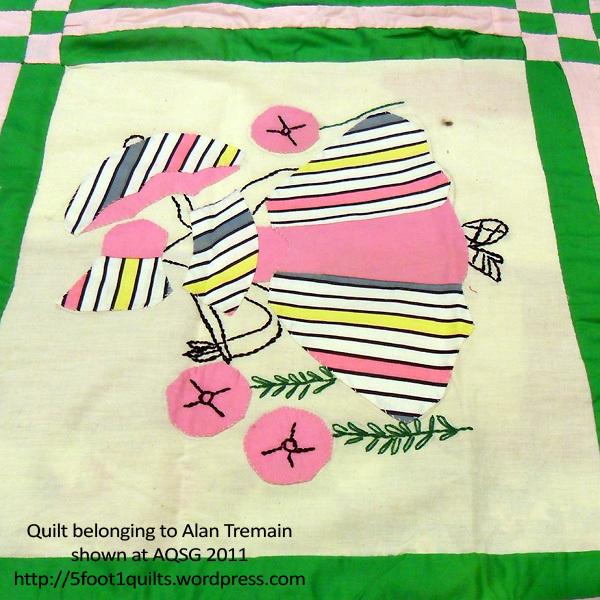 This quilt was made from many beautiful velvets and silks, which when examined closely showed tiny embroidered flowers on many of the centres. This was followed by Margaret Rolfe stepping in for Dr Annette Gero, who was unable to attend at the last minute. 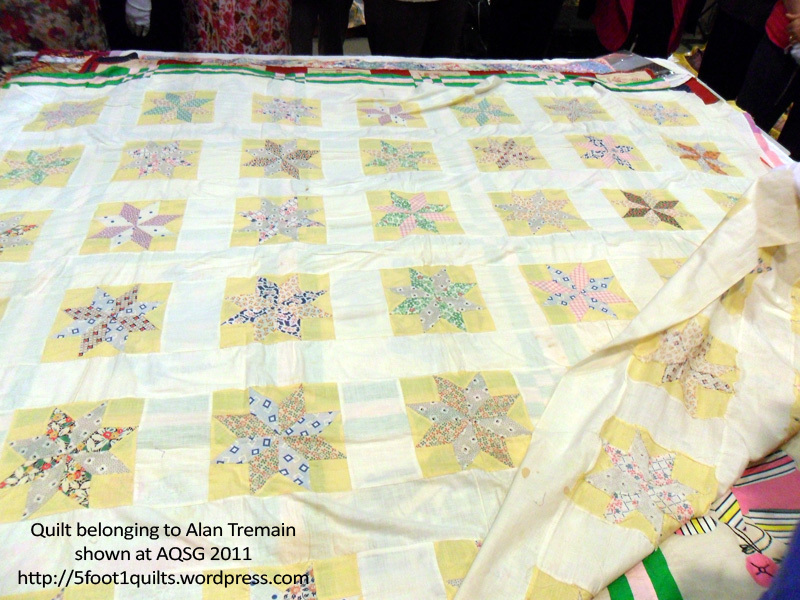 As part of the Annette Gero presentation several participants of the ‘Fabric of Society’ challenge brought along their quilts for us to get up close and look at. Dear Prudence by Linda White was one. 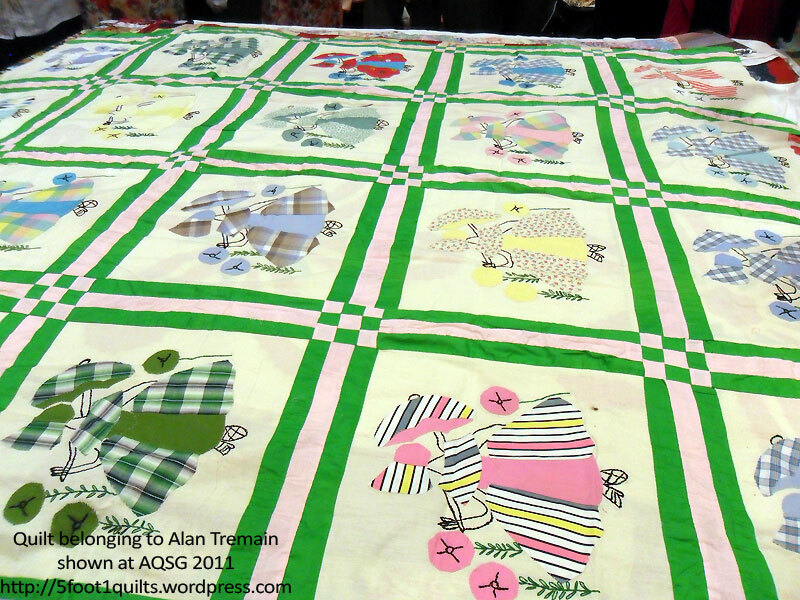 After lunch Margaret Rolfe spoke about an applique quilt of Irish origin held in the NGV, as well as similar Irish quilts of the time and their common elements. 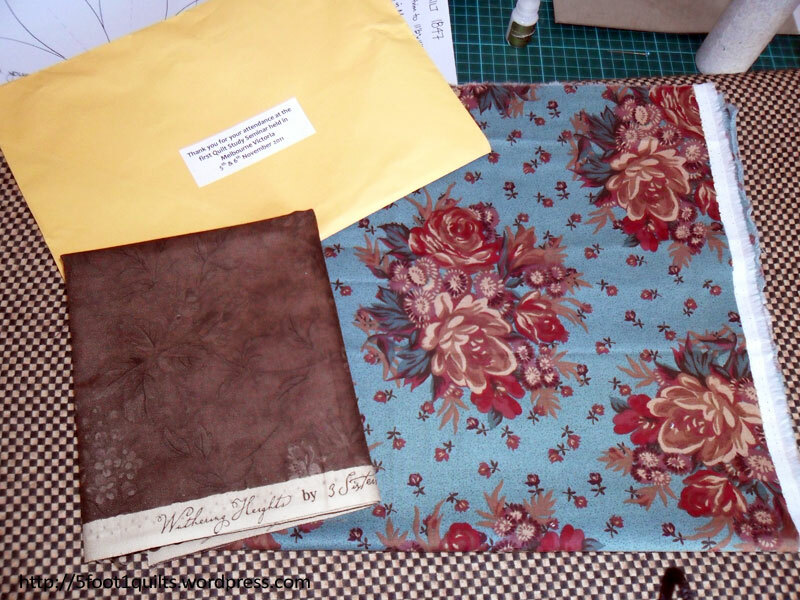 Lynette Nilaweera formerly from ‘The Wool Quilt Prize & Geelong Wool Museum’ spoke about her experiences curating the Prize. 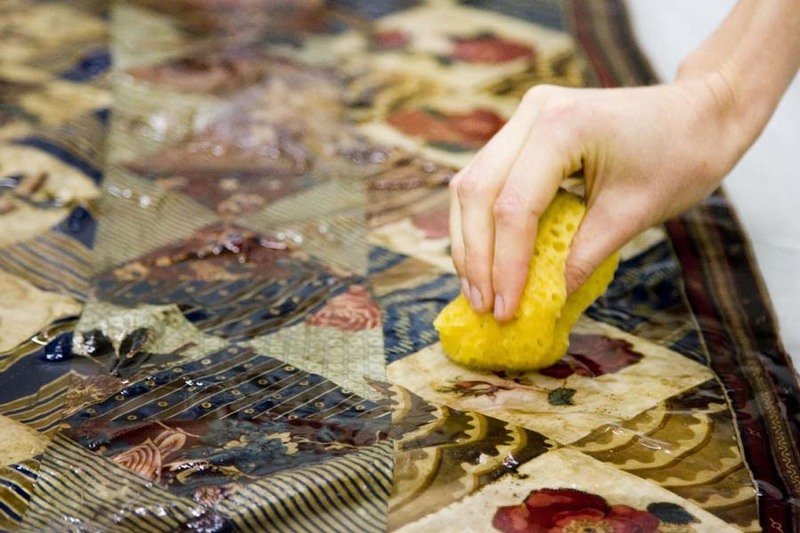 Brownwyn Cosgrove, a senior textile conservator from the NGV spoke about and show a presentation on the conservation process they went through for ‘The 1840s Dickens Quilt’. 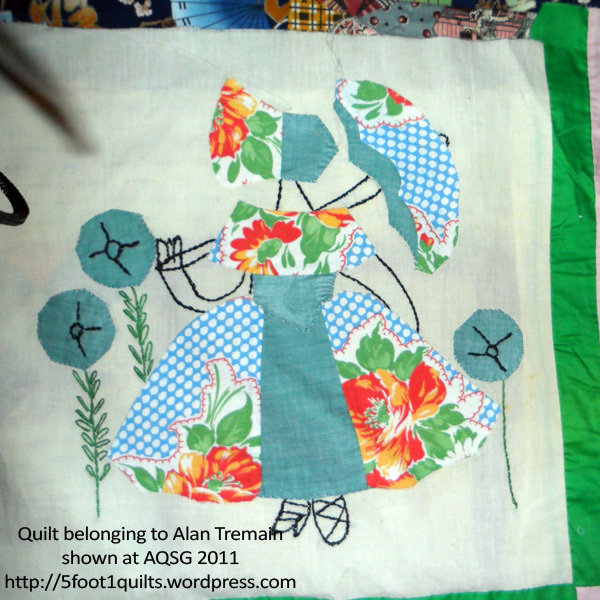 Day Two was were we actually got to get up and personal with some quilts. 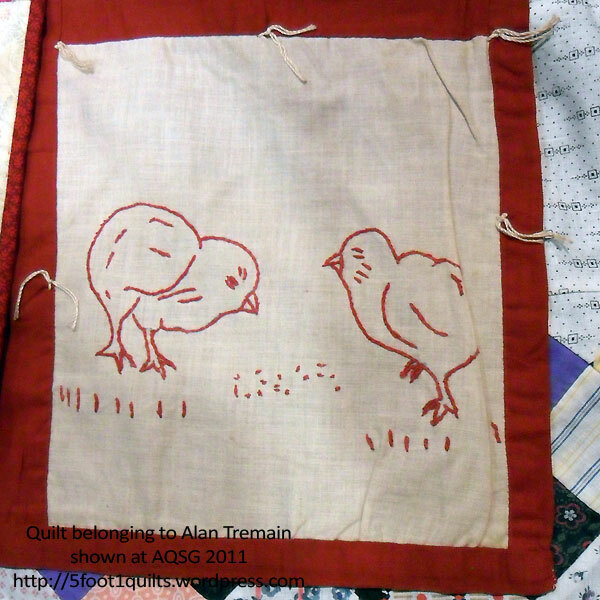 Alan Tremain presented a range of quilts which he was happy for us the examine and photograph. How bright are these colours? 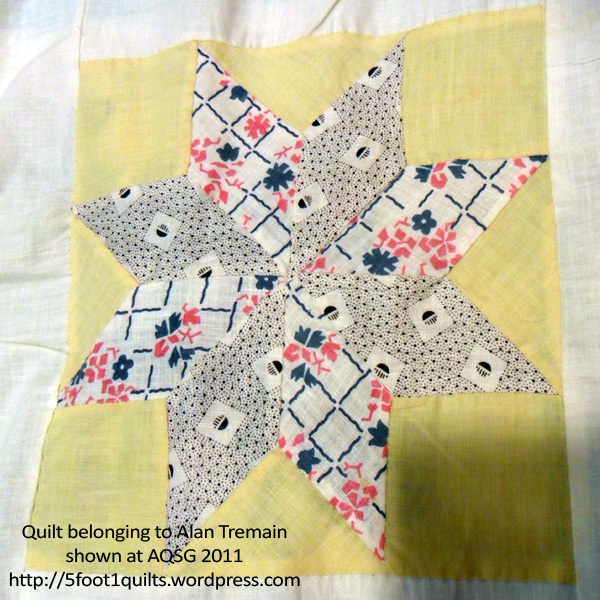 the next image is of some pre-printed cushion embroidery squares. 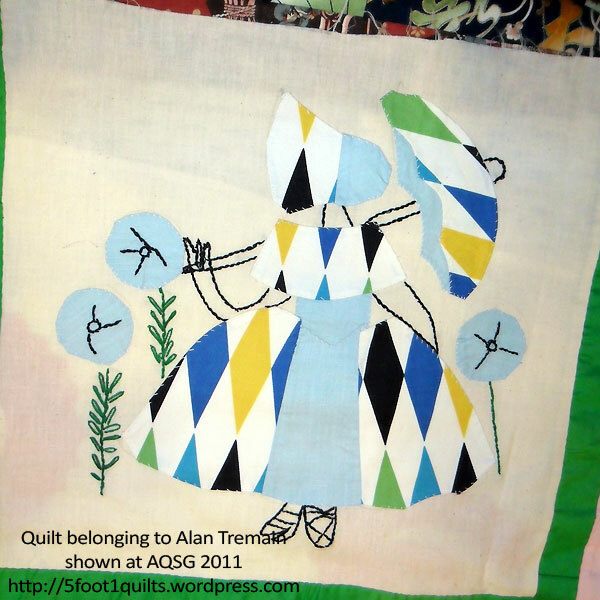 Alan spoke about how often before these patterns were printed in the newspapers, the male image artists would go over the designs putting in intricate detail that no embroiderer would actually put in their designs. 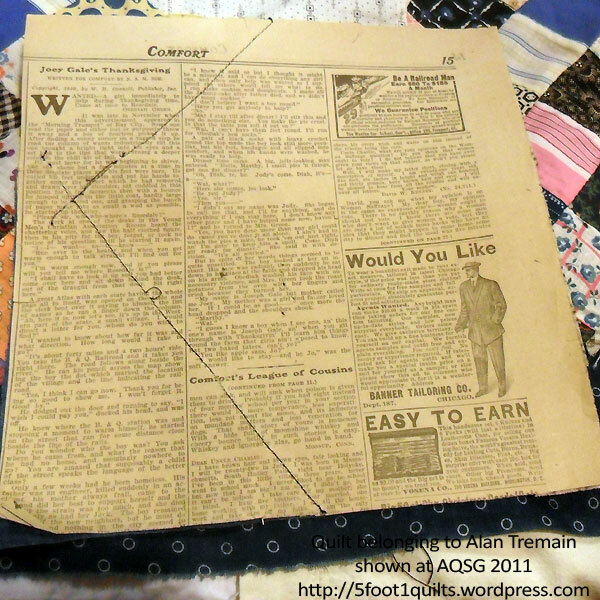 and some machine foundation piecing circa 1916, maybe or at least that was a date we found on the paper. 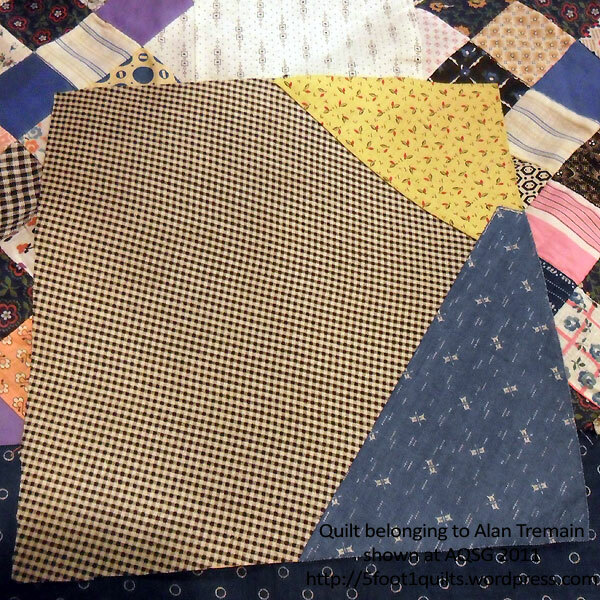 I still have lots more to cover but I think its time to go and do some work so I’ll try an do another post in a day or two.